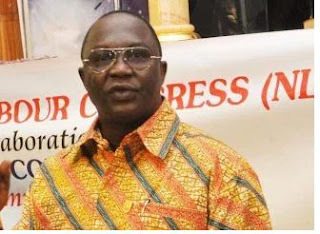 The national president of Nigeria Labour Congress (NLC), Comrade Ayuba Wabba, has assured that that the Nasarawa State government has undertaken to abide by the recommendations of the National Human Rights Commission (NHRC) on the deduction of workers’ salaries pending the outcome of its investigation. The commission had on Monday, 15th August, 2016, commenced full investigation into the killing of two workers protesting downward review of salaries in the state by security operatives. Wabba who stated this while addressing workers in Lafia yesterday said the state government had officially written to the NLC on its readiness to revert to the status quo on salaries of workers which prompted the suspension of the earlier scheduled protest by labour. He said: “We have received formal communication, we have also received formal advice, we have also sat and considered what is best in the interest of all of us and we have come to the conclusion that we should abide by the advisory from the NHRC. “We have called off our procession round the city just as Human Rights Commission has advised and therefore will give them the benefit of doubt, but we will follow up with the protest to make sure that we are not also surcharged”. The labour leader added that the situation in Nasarawa State was painful given the fact that it came at a time Nigerians were facing hard economic crunch across the country. “The era of deducting salaries of workers arbitrarily must come to an end. We have gotten to where we are through collective struggle and we have always won. Therefore I urge you to remain steadfast and resolute,” he said. He appealed to governments at all levels in the country to cultivate the habit of abiding by the laws of the land and come to terms with the fact that workers’ salaries is not a privilege but a right that should not be toyed with at will.